I have a couple of cookbooks on Sicilian cuisine, which I find very fascinating. You’d think I’d have visited Sicily by now, especially since I’m half French and half Sicilian. But I haven’t. It is on my travel bucket list, however. I’m not using a specific Sicilian recipe today, but one that I’ve created in my mind after glancing through pages of these cookbooks. Call it Sicilian-inspired. 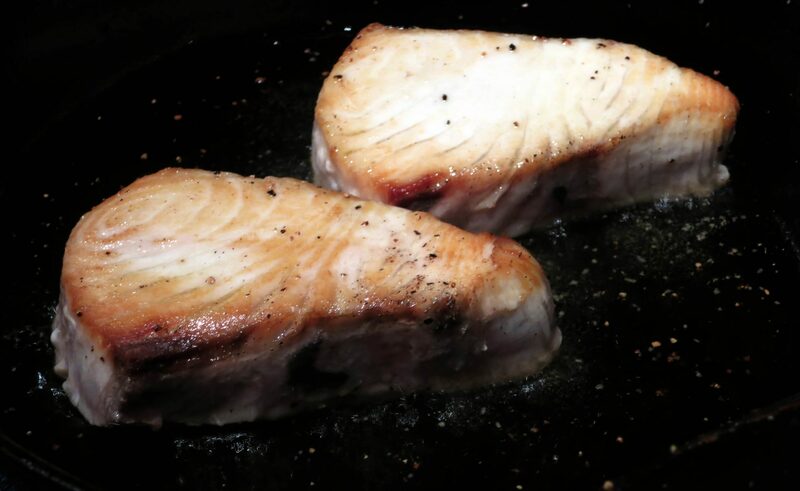 The wahoo steaks will get cooked very simply, then I will serve them with an olive-based four-ingredient topping – simple ingredients yet strong flavors that will enhance the wahoo. Quick and easy. 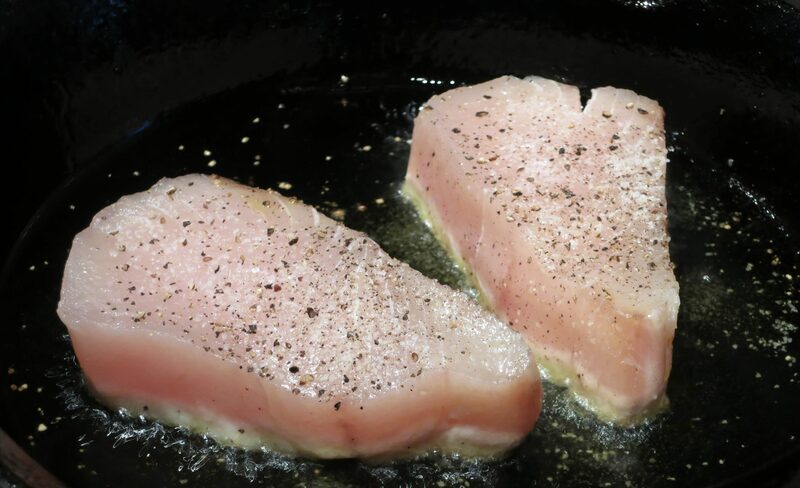 First, place a cast iron skillet over high heat. Add some olive oil to the pan. When the oil is hot, and the wahoo steaks. Season them with salt and pepper. After about one minute, turn them over. Season them on the other side. After another minute, turn off the stove but keep the steaks in the skillet. 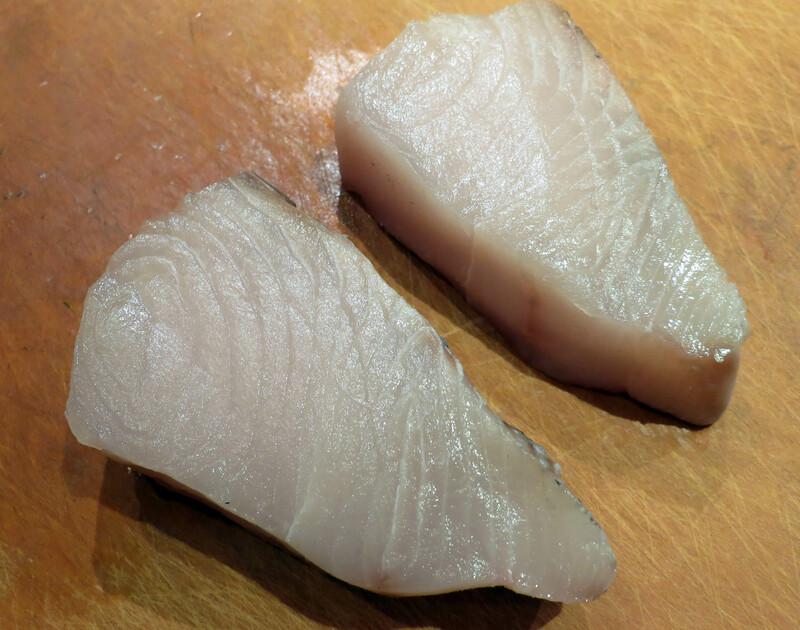 This gives the wahoo a chance to cook in the middle, without any further browning. 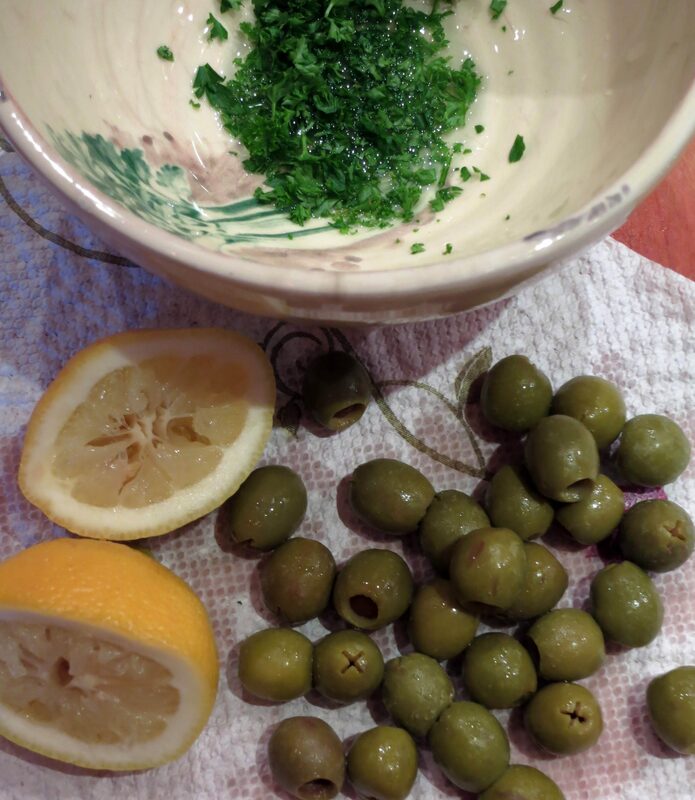 Meanwhile, chop up the olives and place them in a small bowl along with the chopped parsley, the lemon juice, and the minced garlic. Stir well. After about ten minutes after the stove was turned off, remove the steaks from the skillet and place them on two plates. Top each of them with half of the olive mixture. 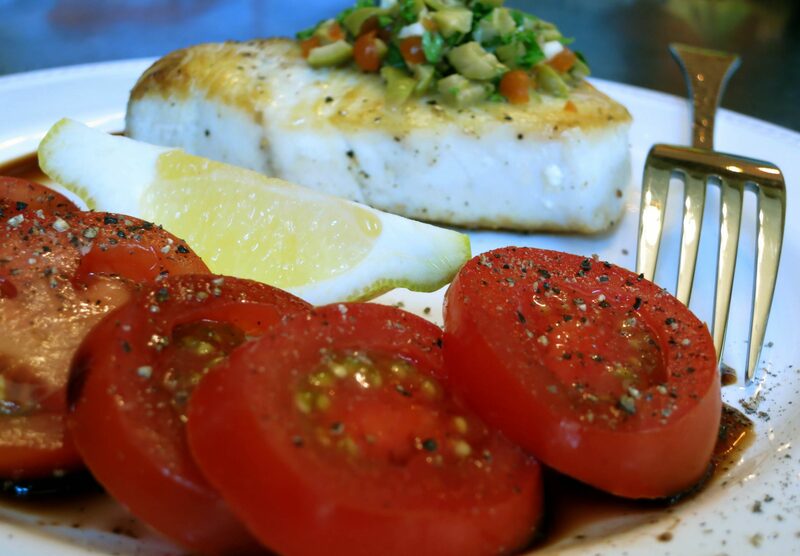 I served my wahoo with a simple tomato salad with a drizzle of balsamic vinegar. 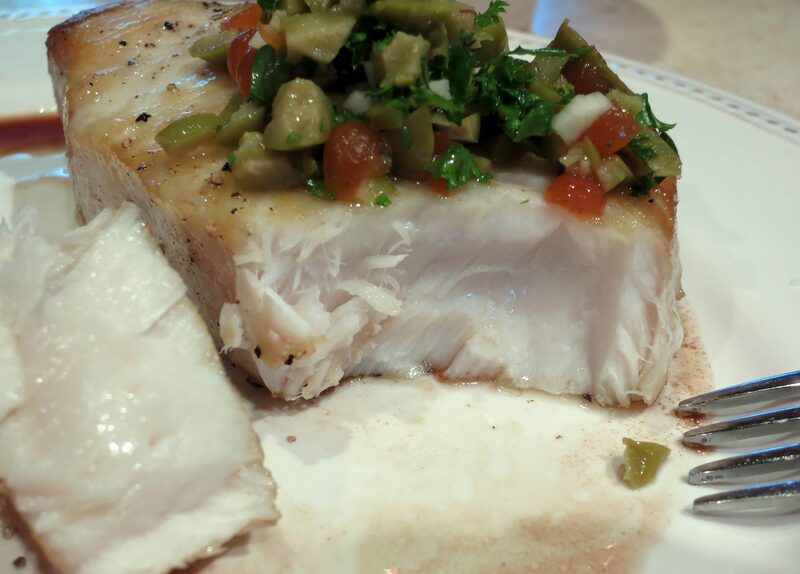 You can use any method you prefer to cook the wahoo. It’s just important not to overcook it. See how tender it is? verdict: I’m extremely happy with this dish. The olive topping really goes well with the fish. I think I’d make this again! That fish looks great Mimi, very tender and juicy! 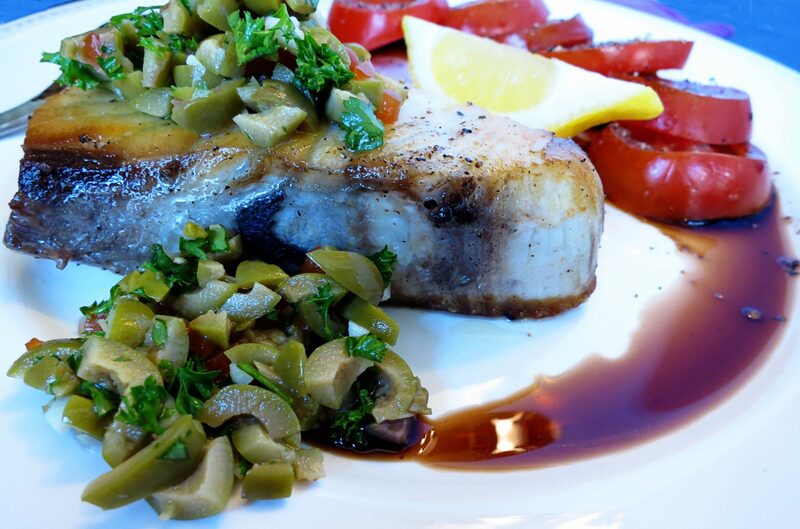 I bet it would also be great using the Sicilian recipe for swordfish (which is also with olives and tomatoes, but the fish is simmered in the sauce). It would be good! Unfortunately I’m out! Stefan, you should write a post on how you came to love Italian food and even started cooking in the first place! You’re so talented! Just a suggestion! Thanks Mimi! I’m not exactly sure how that all happened, but it certainly is a nice idea for a post. I think a lot of us would find it fascinating. You’re too kind :-) Perhaps I should have someone interview me to get to the bottom of this. Looks like a light and delicious meal! since i love kalamata, i think i’m gonna use my kalamata for that…. Kalamatas are delicious. I think those would be good as well!! A delightful classical dinner that I so much love,…MMMM! It doesn’t get much better, does it?!!! Love fish … and I will do this with tuna or salmon – thanks a million for this recipe – will come back with the verdict. This did work out well for a quick little recipe. Do tell me what you think! Never heard of this fish! Looks fantastic! Thanks! It’s called Ono in Hawaii, if that helps. Never heard of this before either but yohoo for wahoo!